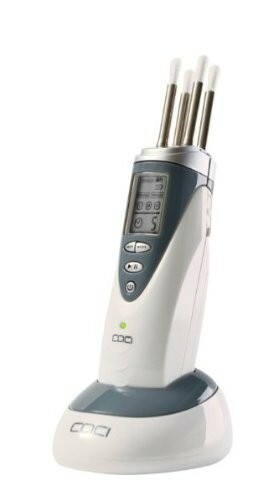 The CACI Microlift Personal Facial Toning System is unlike any other home facial treatment system. This unique device uses a patented muscle gripping action in combination with micro current stimulation. These tiny electrical impulses work in harmony with the body’s bio-electrical field to gently and painlessly help tone the face muscles, soften the appearance of fine lines and wrinkles and improve skin texture to give a more youthful looking complexion. Jennifer Lopez appeared at the opening ceremony of the World Cup in Brazil with a radiant skin, wrinkle free, glowing complexion. She regularly credits her look to this advanced, non-invasive facial, with twenty years medical research behind it. She has invested in one at home for frequent access to muscle tightening treatments and you can too.Comes complete in original packaging with charger, batteries, instructions and 1 Box of 100 electro buds. Featuring dedicated treatment programs that target both muscle tone and three intensity levels to target specific facial areas. The Toning Program emits low frequency electrical impulses to stimulate and re-energize the facial muscles to improve tone and elasticity. The Wrinkles Program releases higher frequencies to target skin tissue and to assist the penetration of the Electro Buds active ingredients helping to soften and reduce the appearance of fine lines and wrinkles. Before: The Wrinkles Program is a 5 minute treatment that helps to improve skin texture and visibly reduce the appearance of fine lines and wrinkles. After: The CACI Microlift’s skin smoothing action and high frequency electrical impulses stimulate blood circulation and collagen production to help plump out and soften the appearance of wrinkles. Please note: your CACI Microlift Personal Facial Toning System comes with a spare set of batteries. Replacement CACI Microlift Electro Buds are available for purchase here. For optimum results CACI recommend a minimum course of 12 professional treatments available here. CACI recommend 3 treatments per week, leaving a day in between each treatment. To maintain results you should have at least 2 treatments per week, but if preferred you can still continue to have 3 treatments per week.